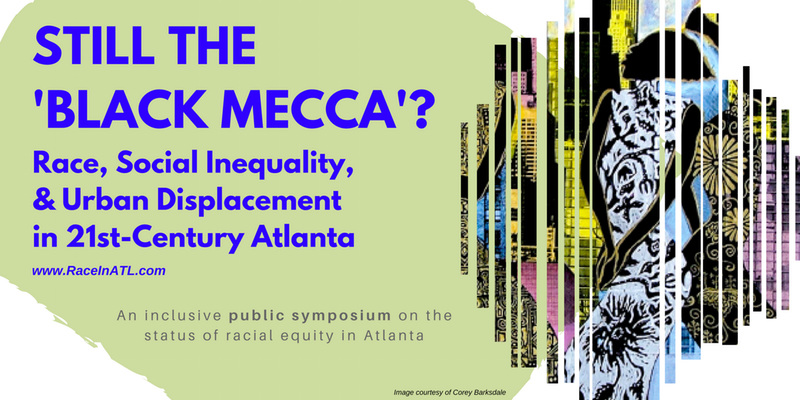 This symposium offers four separate panel discussions addressing the status of racial equity in Atlanta, presented by GSU scholars (including the library’s Joe Hurley, the Department of Sociology’s Mathew Gayman, Jung-Ha Kim, George Greenidge, and the Department of African American Studies’ Maurice Hobson) and various others from metro-Atlanta universities and organizations. It culminates with a reception that includes a film screening of “Emmett Still” by Fahamu Pecou, a poster signing by the official event artist Corey Barksdale, and a book signing by Andrew Young of his recently-published book, Andrew Young and the Making of Modern Atlanta. “Atlanta: A Black Mecca?” by Robert D. Bullard, Glenn S. Johnson, and Angel O. Torres in Bullard, R. D. (. D. (2007). The Black metropolis in the twenty-first century: Race, power, and politics of place. Lanham, MD: Rowman & Littlefield Publishers. “Black Mecca Reconsidered: An Analysis of Atlanta’s Post-Civil Rights Political Economy” by Claude W. Barnes, Jr. in Lashley, M. E., & Jackson, M. N. (1994). African Americans and the new policy consensus: Retreat of the liberal state? Westport, Conn.: Greenwood Press. Morris, J. E., & Woodruff, S. E. (2015). Adolescents’ perceptions of opportunities in the U.S. South: Postracial mirage or reality in the new black Mecca? Peabody Journal Of Education, 90(3), 404-425. Hankins, K. B., Cochran, R., & Derickson, K. D. (2012). Making space, making race: Reconstituting white privilege in Buckhead, Atlanta. Social & Cultural Geography, 13(4), 379-397. Strait, J. B., & Gang, G. (2015). The impact of increased diversity on the residential landscape of a sunbelt metropolis. Southeastern Geographer, 55(2), 119-142. This entry was posted in African American Studies, Books, Ejournals, Faculty Publications and Research, For Faculty, For Graduate Students, For Students, Geosciences, Sociology. Bookmark the permalink.